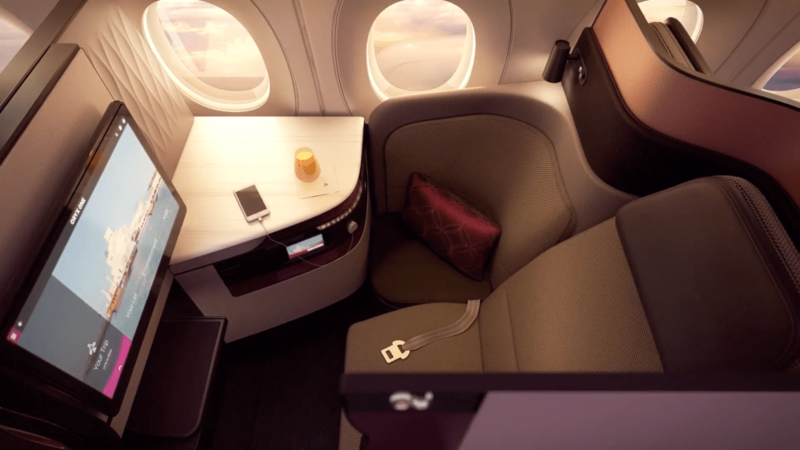 Qatar Airways has gone above and beyond with their innovative new business class concept – the Qsuites. Christmas came early in 2017, with the first flights with Qsuites taking off on December 16 from Doha to New York. With new routes added and more on the way, the world’s best business class will undeniably dominate the skies. So why exactly are Qsuites a first in business class? Let’s find out. The Qatar Airways Qsuites have been described as an innovation in airline cabin design by many experts and frequent flyers. A major element that makes the Qsuites so innovative is their flexibility and design. The business class section is made up of two cabins – a front cabin with 24 seats, and a smaller rear cabin with 18 seats. Altogether, there are 42 business class seats – 20 of which are forward-facing, and 22 rear-facing. 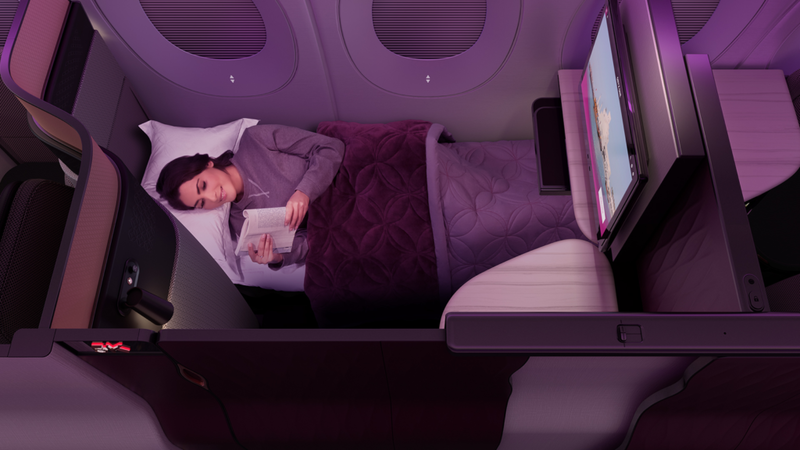 There are six paired seats in the center of the cabin, which allow for a double-bed setup, and the first five sets of seats can be booked as a Quad seat arrangement. The window seats are private. The private Qsuites are a perfect match for the solo traveler. The majority of these seats are window seats (except for seats 1A & 2B) and overall offer the most privacy. Traveling with your loved one? The double Qsuite was made just for you (two)! Now you can enjoy even more quality time together in your double suite. These suites run along the center of the cabin and are paired and facing the same direction. Want to feel even cozier? 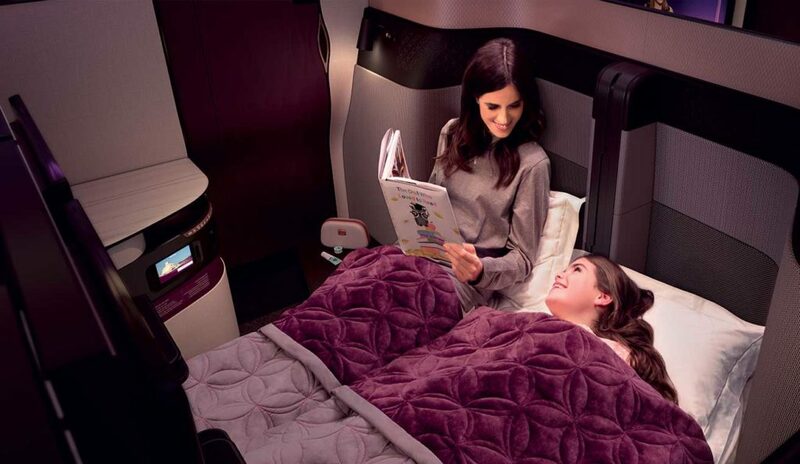 Just ask your lovely Qatar Airways staff member to assist you to convert your seats into a double bed. Couples that fly together, stay together! If you are traveling in a group of 3 or 4 people, say your family, colleagues or friends, you can book a quad suite. The Quads are truly innovative because they allow you to convert two pairs of double seats into a four person room. So now you can enjoy some family time or even have a business meeting. If you feel like you need a break from all the socializing, one push of a button will pull up your privacy dividers and leave you either alone or with your next door neighbor. This flexibility and choice unquestionably puts Qatar Airways’ Qsuites into a league of their own. In fact, the flexibility and innovation of the Qsuites are not the only reasons why Qatar Airways boasts the world’s best business class. Let’s take a deeper look at what else the Qsuites have to offer. When you first enter your Qsuite you will be amazed at how much space you have. Other business class seats don’t even come close in terms of size and comfort. Who doesn’t love to sleep? Well, you’ll have the chance to get plenty of it on your next flight with the Qsuite. All of the 79” seats convert into a fully-flat bed, and half of the center seats convert into a fully-flat double bed. The seats are made of the highest quality fabrics, and you’ll also enjoy pillows, a quilted mattress, and a soft blanket. Pajamas are complimentary, and once you are ready for a dreamy sleep you can turn on a ‘Do Not Disturb’ indicator to ensure no disruptions. 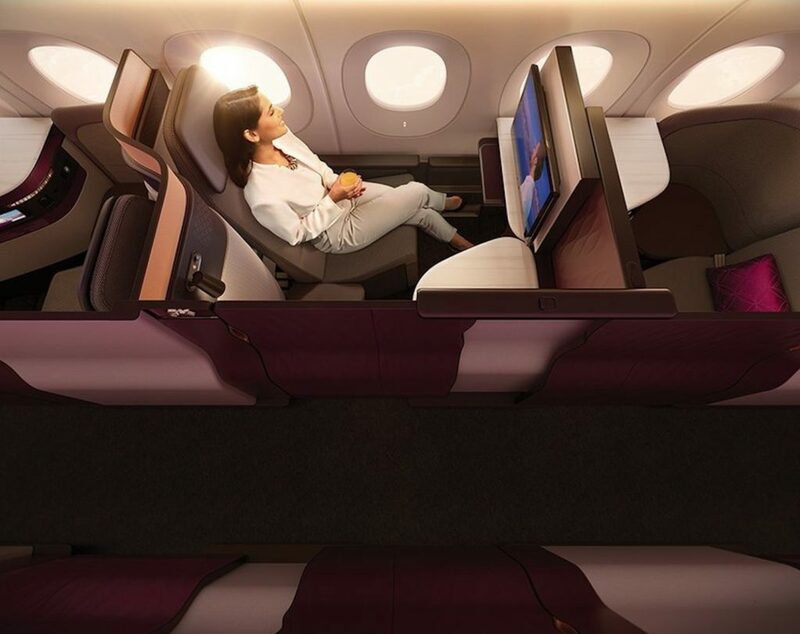 The business class cabin is decked out in the rich colors of Qatar Airways – burgundy and gray – with hints of rose gold detailing flowing through the entire cabin. These classy hues make the whole cabin feel markedly luxurious and are complemented by the calming ambient mood lighting. The Qsuites also contain a cocktail table, amenity shelf, a storage ottoman (that can be used as an armrest or extra seat), a large tv with over 4,000 entertainment options, plus access to a power point, USB, HDMI & NFC capabilities. The amenity kit was designed by two Italian luxury brands, BRIC and Castello Monte Vibiano and contains exclusively designed inflight necessities and skin care products. And last but not at all least, you will experience the award-winning hospitality and care of the Qatar staff and cabin crew. Thereafter the next airports to begin routes with Qsuites are Chicago (ORD), Houston (IAH), and Dallas (DFW) by summer 2018. 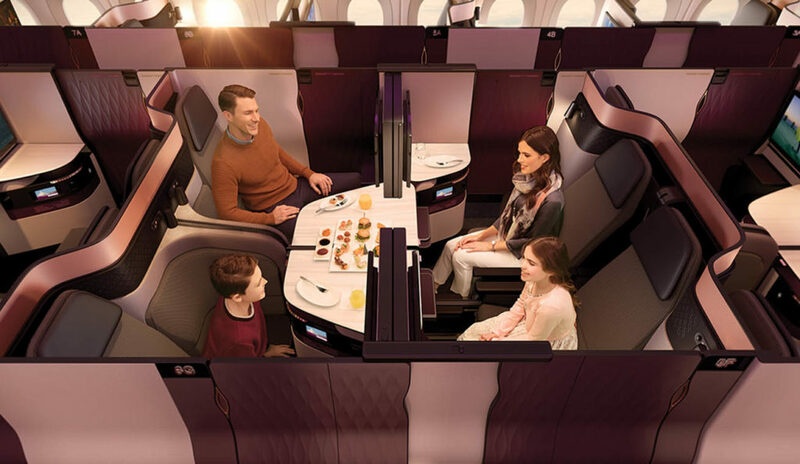 To summarize, if you are looking for a one-of-a-kind, world-class flying experience, the Qatar Airways Qsuites are the best in business class. 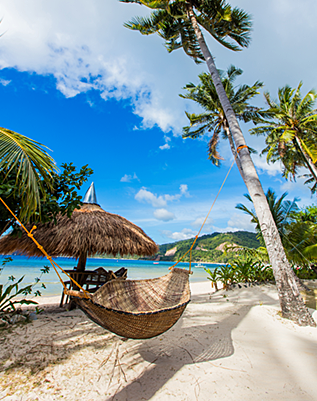 If you would like to get a free price quote, please call a travel agent on 844-300-7983 or use the form on this page. Hi! Thanks for your request, I have passed it on to our travel agents and someone will be in touch shortly!